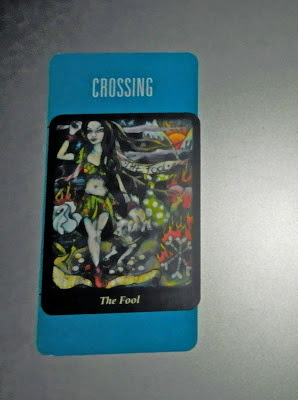 Today's Draw: The Fool from the Bonefire Tarot in the Crossing position from the Deck of 1000 Spreads. Is something coming to the end of its cycle in your life right now? Is it possible you're running away from something before it has concluded? What are you running to? In tarot, the "crossing" card can either help or hinder your topic...it's something that comes across your topic to influence it. So what's the topic at the forefront of your mind these days? The Fool says it may be time to just leave that situation in the dust and create a new beginning. That could signal everything from a new attitude about the situation to a whole new life. The Fool is kind of an interesting card. If the tarot were a movie, the Fool would be the star of the movie. The spiritual story told by the tarot's major arcana is the journey of the Fool. In that way, he's an "everyman". And when we encounter him as Card #0 in the tarot, he stands in two places at once—at the end of one journey and the beginning of the next. The gift of the Fool is that he leaps without looking. He takes a risk and trusts that he will land safely. Ultimately, this is what we all have to do when making a change in our lives. There comes a point when we have to stop standing on the precipice, thinking things through, and take a leap. One of the things I like about the Fool is that, on most cards, we don't see how far the fall is. But you get the idea that the break has to be clean, because that's not a precipice that you want to scale just to peek behind you to see what you might have left behind in your wake. I like that attitude of "goodbye old way, hello new!" One of the drawbacks of the Fool, I think, lies in the attitude you take going into the leap. If you leap wildly out of anger or rebellion or something like that, then your leap might not lead to a better situation. And, of course, you might have enjoyed the place you're leaping from. It has just run its course. So mourn the old before you leap. I remember a time in my life when I wanted to make a big, sweeping change . And a wise person said to me, "make sure you're running toward something that excites you, rather than running away from something." Those words really brought me pause and really made me re-think the way I was thinking. Truth is I WAS running away. And when you run away, your problems follow you. You have to learn the lesson of the old thing before you move into the new. So I stayed put and dealt with the issue. And as I dealt with it, the desire for the other path faded. But sometimes the urge to run away could be what lights a fire under you enough to get to run to. Just make sure you deal with the issues from the thing you're leaving or they'll follow you into the new.